Syrian President Bashar al-Assad said the incident was fabricated, while his ally Russia said an air strike hit a rebel depot full of chemical munitions. Witnesses and activists say warplanes attacked Khan Sheikhoun, about 50km (30 miles) south of the city of Idlib, early on 4 April, when many people were asleep. Mariam Abu Khalil, a 14-year-old resident who was awake, told the New York Times that she had seen an aircraft drop a bomb on a one-storey building. The explosion sent a yellow mushroom cloud into the air that stung her eyes. "It was like a winter fog," she said. She sheltered in her home, but recalled that when people started arriving to help the wounded, "they inhaled the gas and died". Hussein Kayal, a photographer for the pro-opposition Edlib Media Center (EMC), was reported as saying that he was awoken by the sound of an explosion at about 06:30 (03:30 GMT). When he reached the scene, there was no smell, he said. He found people lying on the floor, unable to move and with constricted pupils. Mohammed Rasoul, the head of a charity ambulance service in Idlib, told the BBC that he heard about the attack at about 06:45 and that when his medics arrived 20 minutes later they found people, many of them children, choking in the street. A Medecins Sans Frontieres (MSF) medical team supporting the Bab al-Hawa hospital, near the Turkish border, confirmed similar symptoms in eight patients brought there from Khan Sheikhoun. Rescue workers and opposition activists posted photos and videos on social media that showed victims exhibiting the symptoms described by doctors, as well as many people who had died. The EMC posted photos showing what appeared to be at least seven dead children in the back of a pick-up truck. There were no visible traumatic injuries. Another photo published by the group showed the bodies of at least 14 men, women and children on a street outside a hospital in Khan Sheikhoun. The opposition-run health directorate in Idlib province - which is almost entirely controlled by rebel fighters and al-Qaeda-linked jihadists - says at least 89 people were killed, including 33 children and 18 women. Another 541 people were injured. The Syrian Observatory for Human Rights, a UK-based monitoring group, put the death toll at 86 and said it was likely to rise, with many of the injured in a serious condition in hospital. It was also not immediately clear whether anyone was killed when Khan Sheikhoun's main hospital was struck by a rocket on the afternoon of 4 April. The source of the projectile was not clear, but the EMC said warplanes had targeted clinics and the headquarters of the Syria Civil Defence, whose rescue workers are known as the White Helmets. What were they exposed to? The Organisation for the Prevention of Chemical Weapons said on 19 April that bio-medical samples collected from three victims during their post-mortems had been analysed by two OPCW-designated laboratories. "While further details of the laboratory analyses will follow, the analytical results already obtained are incontrovertible," said OPCW head Ahmet Uzumcu. Mr Uzumcu gave no further details, but Turkish Health Minister Recep Akdag said on 11 April that traces of one of the decomposition products of Sarin, a chemical known as isopropyl methyphosphonic acid (IMPA), had been detected in the blood and urine of victims brought to Turkey. A declassified report by French intelligence agencies published on 26 April said analysis of environmental samples collected in Khan Sheikhoun had also revealed the presence of Sarin, diisopropyl methylphosphonate (DIMP) and hexamine. The report concluded that the Syrian government had manufactured the Sarin because the process of synthesizing the nerve agent developed by the Syrian Scientific Studies and Research Centre (SSRC) and employed by the Syrian armed forces and security services involved the use of hexamine as a stabilizer. DIMP was also known as a by-product generated by this process, it added. A Syrian military statement published by state media on 4 April denied the use of "any chemical or toxic substance" in Khan Sheikhoun, adding that the military "has never used them, anytime, anywhere, and will not do so in the future". 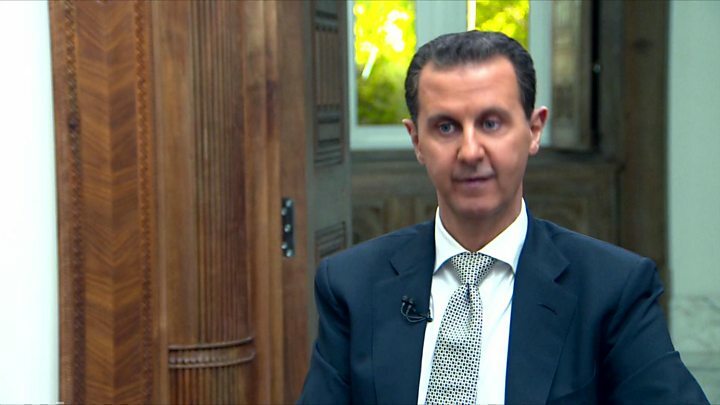 President Bashar al-Assad subsequently said the incident was a "fabrication" used to justify a US cruise missile strike on Syria's Shayrat airbase on 7 April. Media captionBashar al-Assad, speaking in an interview approved by the Syrian presidency: "A 100%... fabrication." "Our impression is that the West, mainly the United States, is hand-in-glove with the terrorists. They fabricated the whole story in order to have a pretext for the attack," he told AFP news agency. Mr Assad insisted that it was "not clear" whether an attack had even happened. "You have a lot of fake videos now," he said. "We don't know whether those dead children were killed in Khan Sheikhoun. Were they dead at all?" Russia, which has carried out air strikes in support of President Assad since 2015, said the Syrian air force had struck Khan Sheikhoun "between 11:30am and 12:30pm local time" on 4 April, but that the target had been "a large terrorist ammunition depot" on its eastern outskirts. "On the territory of the depot, there were workshops which produced chemical warfare munitions," it added, without providing any evidence. "Terrorists had been transporting chemical munitions from this largest arsenal to the territory of Iraq." The ministry said the chemical munitions had also been used during the final stages of the battle for control of the northern Syrian city of Aleppo last autumn, asserting that the symptoms of the victims were "the same". 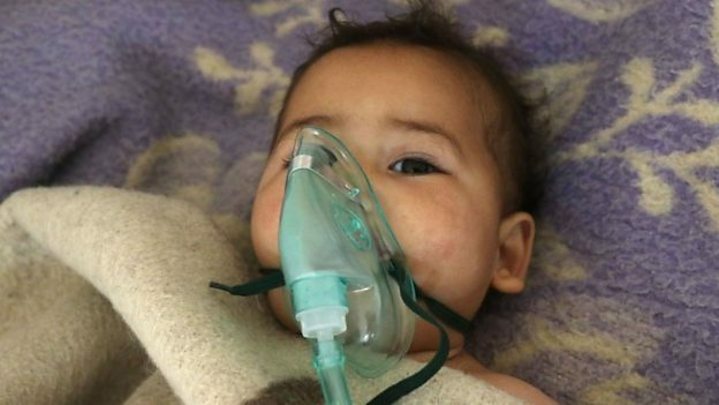 Syria chemical 'attack': What now? US military radar systems monitored Syrian Air Force Sukhoi Su-22 fixed-wing aircraft take off from the government-controlled Shayrat airbase on 4 April and fly over Khan Sheikhoun on two occasions - at 06:37 (03:37 GMT) and 06:46. Hamish de Bretton-Gordon, a former commanding officer of the British Armed Forces Joint Chemical Biological Radiological Nuclear (CBRN) Regiment, said Russia's assertion that the strikes had hit rebel chemical weapons were "pretty fanciful". The explosion resulting from an air strike on a chemical weapons facility would most likely incinerate any agents. Sarin and other nerve agents are also usually stocked in a "binary manner", which means they are kept as two distinct chemical precursors that are combined just before use, either manually or automatically inside a weapon when launched. "It's very clear it's a Sarin attack," Mr de Bretton-Gordon added. "The view that it's an al-Qaeda or rebel stockpile of Sarin that's been blown up in an explosion, I think is completely unsustainable and completely untrue." He also noted that chlorine was the only chemical believed to have been used in attacks in Aleppo over the past year. A recent report by Human Rights Watch said government helicopters had dropped bombs containing chlorine on rebel-held areas of Aleppo on at least eight occasions between 17 November and 13 December, killing nine civilians. It was also not clear why there was five hours' difference between the time of the strike reported by multiple witnesses in Khan Sheikhoun and that stated by Russia. Moscow's short account gave no evidence for its suggestion that a group was sending chemical weaponry to Iraq. So-called Islamic State, which has used the the blister agent sulphur mustard in Syria and Iraq, is not present in Khan Sheikhoun. Hasan Haj Ali, commander of the Free Idlib Army rebel group, called Russia's claim a "lie" and said rebel fighters did not have the capability to produce nerve agents. The report by French intelligence agencies supported that assertion, saying no opposition armed groups in Syria were believed to have the capability to employ a neurotoxic agent, or the air capacities required. It also said the theory of a staged attack or manipulation by the opposition was not credible, citing "the massive influx in a very limited time towards hospitals in Syria and Turkey, and the simultaneous, massive uploading of videos showing symptoms of the use of neurotoxic agents". Sarin is highly toxic and considered 20 times as deadly as cyanide. As with all nerve agents, Sarin inhibits the action of the acetylcholinesterase enzyme, which deactivates signals that cause human nerve cells to fire. This blockage pushes nerves into a continual "on" state. The heart and other muscles - including those involved in breathing - spasm. Sufficient exposure can lead to death via asphyxiation within minutes. Sarin is almost impossible to detect because it is a clear, colourless and tasteless liquid that has no odour in its purest form. It can also evaporate and spread through the air. Has Sarin been used in Syria before? President Bashar al-Assad denied the charge, blaming rebel fighters, but he did subsequently agree to destroy Syria's declared chemical arsenal. 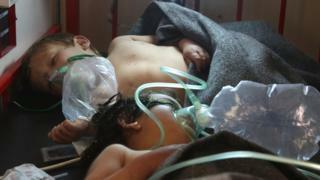 Despite that, the OPCW and UN have continued to document the use of chemicals in attacks. A joint investigation concluded in October that government forces had used chlorine as a weapon at least three times between 2014 and 2015. It also found Islamic State militants had used sulphur mustard in one attack.